Yale Head Coach Margot Sanger-Katz (left), Advanced Walk-Trot-Canter Rider Donnell Gavin and Assistant Coach Phoebe Heffron are happy that Gavin won her class at the March 20th Molloy/C.W. Post Show. The bulldogs are taking a full team to Zone 3 Zones for the first time because of it. Melville, NY - It wasn't pretty, but they will take it. Yale University, never even as high as reserve for an entire year in previous seasons, waited through six divisions before freshman advanced walk-trot-canter rider Donnell Gavin won the bulldog's second blue ribbon of the day to mathematically clinch a tie for the Region Title. Shortly afterwards, a pointed Fairfield rider finished out of first place, making Yale the 2004-05 Zone 3, Region 1 High Point Team. In contrast to last season's spring show at the Thomas School, held under sunny skies but chilly temperatures, the weather was cold and damp, forcing almost the entire show to be held indoors. Only the first four sections of the day were held outside, with a persistent drizzle throughout. Sacred Heart senior Emily Grayson won open flat to start the day, while Fairfield's Caitlin Kelly won section 7B shortly thereafter. Finishing second to Kelly was Stacey Munoz of Stony Brook, who caught a break when Sacred Heart's Kate Janczak had difficulty with her horse's transitions. Janczak entered the day with a ten point lead over Munoz in the race for the Region's Cacchione Cup entry at Nationals. With Janczak out of the ribbons, Munoz temporarily trailed by five, with no one else still in the running. The third section started a trend of delays within the show. Elizabeth Jordan of Yale had a fresh horse that kept bucking. Rather than pull the horse, all of the open riders were asked to stay at the walk for a prolonged period of time (roughly six minutes) to see if it would help. Jordan, who was pointed, still had problems with the paint. Stacey Caldwell of C.W. Post won the section, while Jordan, who was not given a re-ride, was out of the ribbons. The final class held outdoors was alumni flat. This time it was Sacred Heart alumni rider Krissy Brackenridge having trouble with a fresh horse. Yale Head Coach Margot Sanger-Katz was not too happy to see Brackenridge's horse pulled after her request for Jordan's horse to be pulled was denied moments earlier (Jordan and Brackenridge did not ride the same horse for the record). Sanger-Katz saw all of this from inside the ring, as the Yale Coach is also an alumni rider. During the time Brackenridge received a new horse, the remaining alumni had been at the 'halt' for over five minutes. Sanger-Katz did get one benefit from the long pause. She won the alumni flat, having needed a first to qualify for Regionals in the division. Two sections of open fences followed, and despite the somewhat small size of the Thomas School indoor, only one rider fell off in 17 open trips. Janczak needed three points to clinch the region's high point open rider honor, and the senior from Balston Spa, New York went on to finish third. Janczak thus advances to IHSA Nationals in Sunbury, Ohio on May 5th through 7th, to be the first Sacred Heart rider in the Cacchione Cup Competition since Head Coach Justin Gregory was sixth in the country riding for his alma mater in 1998. Jocelyn Abbate of Fairfield won the first section, while Jordan earned the first points of the day for Yale with a fifth. 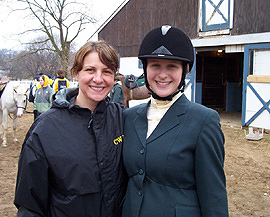 The most interesting part of class 8A was the final IHSA undergraduate ride for Stacey Caldwell. She was fine over the first three jumps when the martingale on her horse snapped! Caldwell still made it over the fourth fence before bringing the equipment problem to the judge's attention. Caldwell left the ring, came back at the end of the section with a new martingale, jumped only the fourth fence through the eighth, and eventually placed fourth. Twin sister Destiny Caldwell rode in section 8B and finished fifth. Yale junior Lizzie Elston won the section but was not pointed. Though both Caldwell sisters have had very good IHSA careers (Destiny was the Region 1 Cacchione rider at 2004 Nationals), neither managed to qualify for Regionals in either open division this season. Stacey remarked afterwards that "This is it," unless C.W. Post managed to come back and win the region. It went down to the second open division of the day. Her third place ribbon in the first section of open fences clinched a trip to Nationals for Sacred Heart senior Kate Janczak (right), who edged out Stacey Munoz of Stony Brook (left) for the right to compete in Ohio for the Cacchione Cup. Two rides for the price of one: Seeing as the show was moving slower that expected, the gatekeepers sent Dowling intermediate rider Lindsay Little into the ring right after the final open fences trip to start the first of two sections of intermediate fences. However no one thought to change the height of the jumps before sending her in! Little went clean and even looked better than several of the open riders who had just gone. Unfortunatly, Little had to ride the course a second time, at the lower level, and did not do as well, finishing out of the ribbons. Tricia Crispins of St. Joseph's was best in the field of ten, while the second intermediate fences class went to C.W. Post's Meghan Kleinschmidt, one of very few in the section to go clean. Alumni fences was also a struggle, as only two of the eight entries went clean. 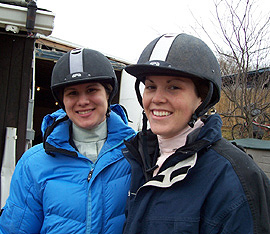 Like Sanger-Katz in alumni flat, Stony Brook alumni rider Erin Graham entered the day with 22 points, needing a win in the division to go to Regionals April 3rd at Fox Ridge Farm in Newtown, Connecticut. Graham turned in a good ride, and got the blue. The only other alumni rider to go clean over the fences was Valerie Ackhanian of Fairfield. Sanger-Katz finished third even with a refusal. Sanger-Katz finished the season as the only Region 1 rider qualified for Regionals in both alumni divisions. Ackhanian and Hofstra graduate Mindy Deleary will join Sanger-Katz at Regionals in the alumni flat while Graham and Sanger-Katz will take advantage of the loophole that allows the top two in each division at Zone 3 Regional Shows to advance to Zone 3 Zones. Since only two alumni qualified over fences, both will advance to Zone 3 Zones April 9th at Briarwood Farm in Readington, New Jersey. From this point forward, the show moved very smoothly. Two sections of novice fences followed, with former S.U.N.Y. - Cobleskill rider Nicole Farrell winning her first-ever ride as a member of the Dowling team. Section B went to Carol Margolis of the short-handed Stony Brook Seawolves, who had only five riders on their point sheet but would devour most of the competition nevertheless. Though Yale had not performed all that well through the first three divisions, the bulldogs had repeatedly caught breaks as no other teams made a move to catch them. With Margolis and St. Joseph's Ashley Carpin both pointed in novice fences (the latter second in the first section), the show started to get interesting. Yale had only two points through four divisions, and was sporting a mere eight point lead over C.W. Post heading into the lunch break. But before lunch, there was the cross rails class. This division, which does not count toward the post-season, simply gives riders at the novice or advanced walk-trot-canter level who otherwise would not jump the opportunity to go over three or four cross rails. In Zone 2, Region 1, the division is known as Maiden Fences; In Zone 3, Region 4, the division is referred to as Maiden Cross Rails, and here simply as Cross Rails. In what turned out to be a good omen, Donnell Gavin of Yale went clean and won the division, perhaps giving her a boost when her turn to ride in the advanced walk-trot-canter would come. C.W. Post Head Coach Jennifer Hennessey (left) and sophomore Susan Rezeppa pose following the latter's third in open flat. Hennessey has guided C.W. Post to reserve status overall within the region three straight seasons, finishing second to three different teams! But first would come the intermediate and novice flat divisions. Following a short lunch break and Coaches & Captains meeting, Colleen Rencher of Molloy won the first section of intermediate flat. However, all eyes were on Yale's point rider, Elizabeth Gerber, who brought home a fourth and three points for the Yalies. Kleinschmidt was fifth, thus giving back a point to the bulldogs. The second intermediate flat section went to Sacred Heart's Ally Grillo, while Fairfield's point rider, Monica Cluff, was second. Through five divisions, Yale now had 178 points for the season. However C.W. Post had 169, Fairfield 168, St. Joseph's 166, Stony Brook (with no intermediate or walk-trot rider on today's point sheet) 165 and Sacred Heart 163. When the day started, Yale had a 15 point lead on St. Joseph's (who were without an open rider this spring) and a 16 point lead on C.W. Post. The division with the most sections on this day was novice flat. Divided into four sections, Yale point rider Gypsy Moore was in the first section and finished sixth, raising the bulldog's total to 179. Winning the section was Lynn Matz of St. Joseph's, who was not pointed (In fact none of the riders in the first two novice flat sections were pointed other than Moore). Sacred Heart's Nicole Lay won the second section. Though Lay was not pointed, another Sacred Heart freshman, in this case Erin Leech, was. Leech won section C while Margolis was second and Carpin fourth. Sacred Heart and Stony Brook thus both moved up to 170 while St. Joseph's found themselves ten back with 169. The final section seemed like deja vu all over again. Region 1 Region President Lisa Bailey, who turned show coaching duties for Fairfield over to Jody Boles sometime in the fall, was on hand and despite personal plans in the late afternoon simply could not leave as her stags kept coming back. Since 1996 Fairfield had a habit of winning the region two years in a row, then taking a year off, then winning it two years in a row again. Last season it was Stony Brook advancing to Zones, so in theory it would be Fairfield's turn to start another two-year streak. Though Gracie McLoughlin of C.W. Post won section D, second went to Fairfield's Laura Palescandolo, giving the stags 173 points and - temporarily - second place, only six points behind Yale. All five of the teams that started the day in the 150's all fighting for second place were within nine points of the bulldogs. Bailey and this writer even started trying to figure out what the second and third tiebreakers were if the region ended in a tie. By this point, several coaches of teams chasing Yale started to pay closer attention to the point sheets. Class 2B-1 was the first of three walk-trot-canter sections, with the third a beginner walk-trot-canter section. Gavin, a freshman from Montgomery County, Pennsylvania, finally gave Yale breathing room over Fairfield and elimination of all the others. Gavin won the first section of advanced walk-trot-canter, lifting Yale to 186 points. It was also the third consecutive show Gavin won her advanced walk-trot-canter class. Provided she was not eliminated by some kooky event (a fall, hitting the horse with a crop outside the ring, trotting into the ring, etc. though only the last of these three mentioned did not happen today), Yale walk-trot rider Melissa Gonzalez would earn at least one point, as her section featured only six riders. For Fairfield to have a chance, both of their remaining riders would have to finish first, Gonzalez would have to finish sixth, and the tiebreaker would have to go to Fairfield, as both would have 187 points with that scenerio. But the light at the end of the tunnel was so bright that Yale junior Bri Sherer made it two in a row when she won section 2B-2 of advanced walk-trot-canter. Sherer was not pointed, but many could detect the weight of the world had shifted off of Yale's shoulders and onto someone else's. The beginner walk-trot-canter was next, including two good Fairfield riders, Maura Rafuse and Shan Shan Zhu. There were only five riders in this section, and Rafuse was pointed. Some worried that Zhu might beat Rafuse, providing the ultimate irony. Bailey thought she saw Rafuse on the wrong lead once. However a horse was pulled from this class after that event which again gave Fairfield hope. When the announcement came, it was Brittany Bouchard, listed simply as "Brittany B" on the point sheet by Head Coach George Lukemire, giving another blue ribbon to the seawolves. More importantly, it was official: Yale had their first Region Championship ever! With no pressure, Gonzalez, a freshman from New York City, was second in her section of walk-trot, won by Catherine Raghunadan of St. Joseph's, while the final class of the day went to Chris Hernandez of C.W. Post. When the point sheets were added, Stony Brook, with three empty spaces on their point sheet, had won the show with 25 points. Co-hosts Molloy College and C.W. Post (no one seems to call them LIU), which both did a fine job running the show under difficult weather-related circumstances, tied for Reserve with 24. Fairfield had 23, Sacred Heart 20, St. Joseph's 19, Dowling 18 and Yale 18. Lukemire, always the best with one-liners, implied the blank spaces on his point sheet were intentional: "We just wanted to give the rest of you a chance." There was no need for a ride-off for high point, as Margolis had left earlier, thus earning reserve status while Abbate got the high point ribbon for still being on the premises. Both had a first and a second over the course of the long day. For the season, Yale finished on top with 191 points, C.W. Post was Reserve with 181 while Fairfield, Stony Brook and St. Joseph's all tied for third with 177. Sacred Heart, which tied C.W. Post for most blue ribbons at today's show with four, finished with 173. When it was nearly all over, Sanger-Katz could joke about it. "They all went to Costa Rica for two weeks and didn't practice. No more Spring Break forever!" said the coach, who was a teammate of the current Yale seniors not all that long ago. Though the bulldogs' bark was worse than their bite today, only three weeks earlier Yale had scored 41 points, putting themselves in the enviable position of being 15 ahead. Regardless of whatever happenned today, Yale will be practicing on a regular basis in the next few weeks, preparing to take on Delaware Valley, Penn State and Bucknell in the team competition at Zone 3 Zones on Saturday, April 9th in Readington, New Jersey, with the top two teams advancing to IHSA Nationals May 5th through 7th in Sunbury, Ohio, near Columbus. Show Incidentals: Overcast skies, occassional rain, with temperatures reaching the mid '40's. Three open flat classes and one alumni flat class held outdoors. All other classes held indoors. Start time: 9:16AM. Finish: 4:17PM - includes 32 minute lunch break/Coaches and Captain's meeting. Point cards posted in this region? Yes. Alumni classes held in this region? Yes. Judge: Connie Lacy - Rock. Stewards: Boles/Fairfield University, Rittereiser/Hofstra University and Rigert/St. Joseph's College. Team Totals: Stony Brook University (High Point Team) 25; C.W. Post College - Long Island University (TIE-Reserve) 24; Molloy College (TIE-Reserve) 24; Fairfield University 23; Sacred Heart University 20; St. Joseph's College 19; Dowling College 18; Yale University 18; Nassau Community College 8 and Hofstra University 4.